I’m writing a Day 3 post on Day 5 of Couture Week. This is not how it usually works at the blog. We attend the show, live-tweet and update you on Instagram, all the while typing notes furiously into the phone. 12 hours later, pictures have been selected, edited & uploaded, opinions written, and a post is published. We like speed here, because we know you want to see the best bridal picks from each show the next morning. You expect it, and we love giving it to you. So you can imagine – this time, when posts have not been published according to our usual schedule, I’ve been smacking myself on the head over and over again. While there are numerous reasons for the delayed posting schedule, there is one that finally lit the light bulb in my head. It’s been “the lack of inspiration”. Sure, the clothes have been nice. But for some reason, they haven’t left me mesmerised, awe-struck, breathless. I haven’t felt magic unravel itself in front me. Of course, I’ve wondered – is this what happens when you’re attending your third year of fashion weeks? All the awe and wonder is unceremoniously rubbed off? The magic is gone? Or am I just tired, with all the extra work that came up right before fashion week began. But isn’t beautiful fashion supposed to leave you feeling high? Reignite a sleepy soul? Have my expectations from fashion week become unrealistic? Or, and really think about this one – is there a genuine lack of beauty this time around. Well, bridal beauty specifically. 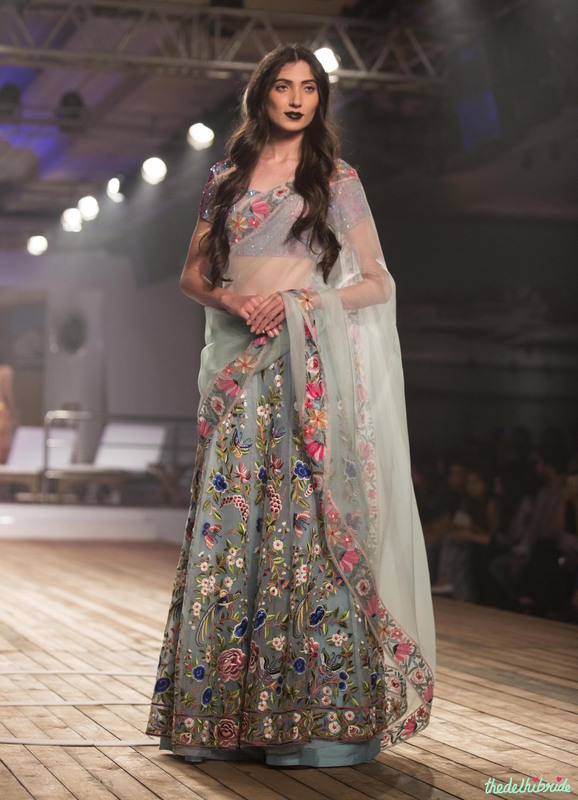 While I lose sleep analysing why India Couture Week is failing to wake me up from my mental slumber, YOU still want to know what the best bridal picks were. Obviously. Trousseau shopping doesn’t stop just because one blogger didn’t fall head over heels in love at one fashion week. Monisha Jaising did alright. Her set felt like I was sitting in the movie – Dil Dhadakne Do – although that wasn’t what she was going for. It’s only because both, the movie and her show, were set on a yacht. Monisha wanted to show us what a bride who gets married on a luxury yacht dresses like. I don’t know about you, but getting married on a luxury yacht sounds pretty damn exciting to me. I loveee the ocean, although – waitaminute – do I get sea sick? I don’t know. Never been out on the water for that long. 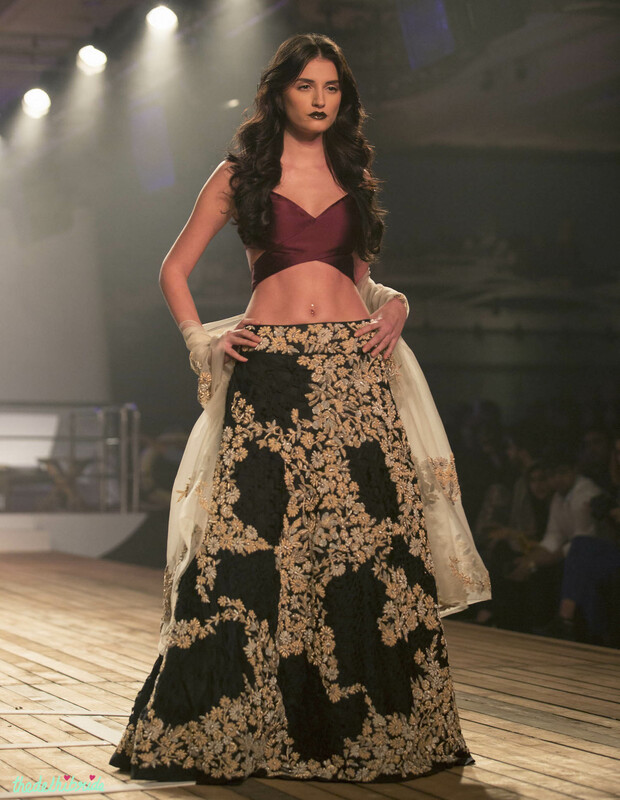 Such as easy, breezy lehenga. While I’m personally not the biggest fan of the blouse, you have to agree that the red and jacket style do work very well with it. 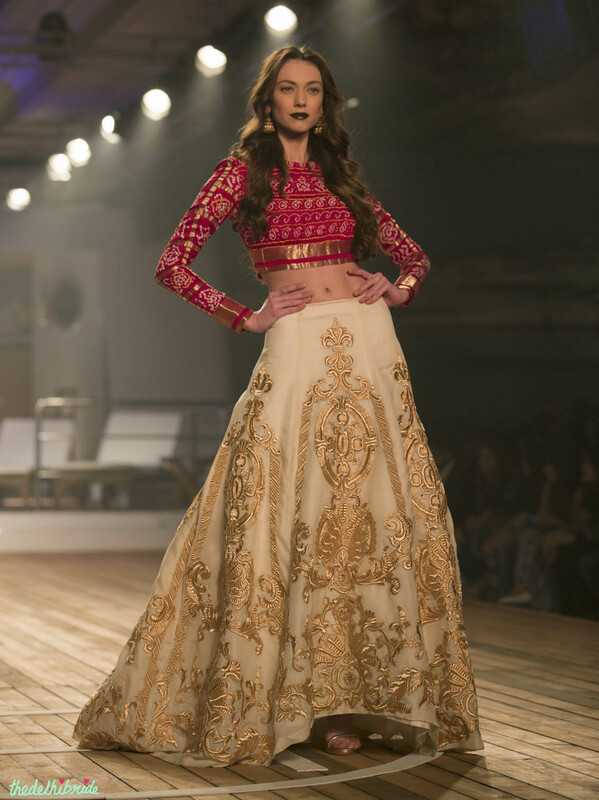 I know, it’s just an ivory and gold striped lehenga. What’s the big deal? Nothing, really. But that doesn’t mean I can’t love it. I’d wear it. Where to wear: If you’re actually getting married on a yacht, you can wear this for any pre-wedding function. And if you’re not fortunate enough to get onto a yacht, or get sea sick too easily – wear this to your Mehendi or friend’s wedding. Again, ignore the blouse. It was the lehenga I found absolutely fascinating. It’s unique, in a pretty kind of way. I really liked the colours. And it’s going to be super light, so you can have non-stop fun. Where to wear: I’d say, your Reception on the yacht. You? This is another one that will make you wonder, “Eh, isn’t this just a nice purple sari?” and I wouldn’t disagree with you. But that’s exactly why I like it. It’s an unassuming piece of clothing, and yet when you look closer, you notice the added dimension the fabric gives to it. 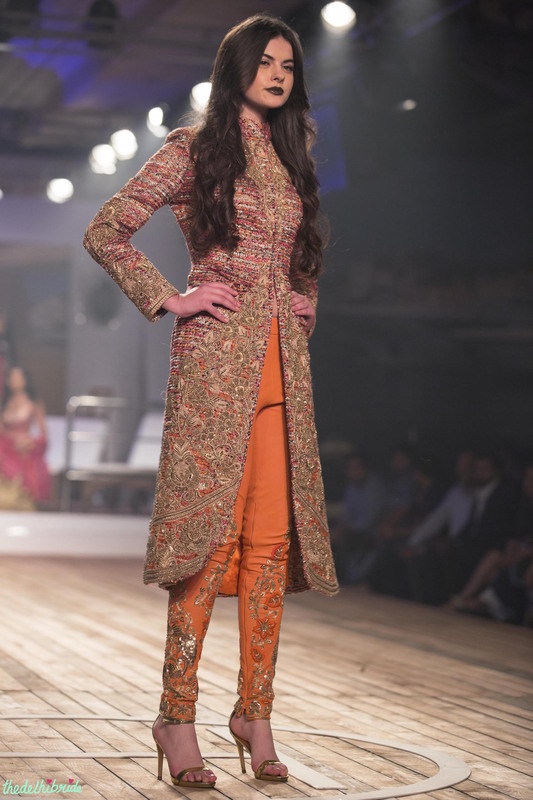 Where to wear: I want this in my trousseau. To wear to a friend’s wedding. Paired with a heavy blouse, and you can always add some bling with literal bling – go crazy with the accessories! 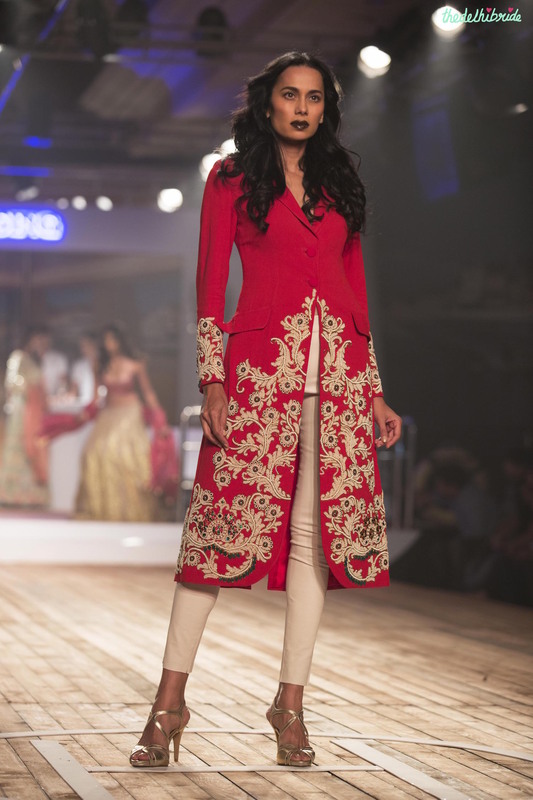 The rest of the outfits were nice too – unique, and they felt like they were made for a young, modern bride. You can browse most of the collection below. 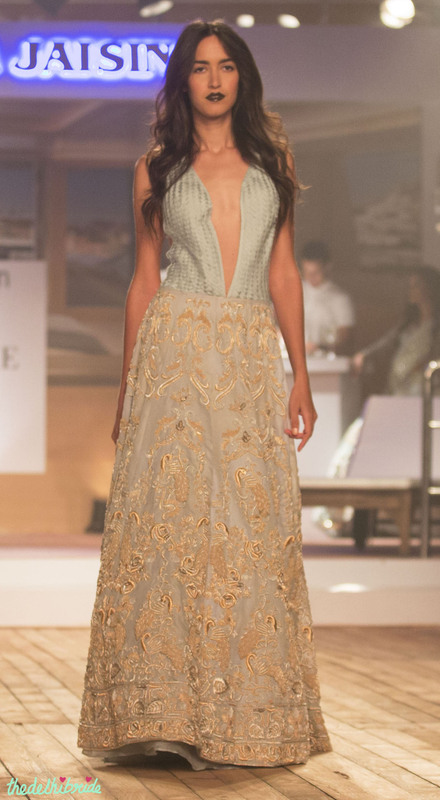 Pernia Qureshi walked out in a winter sky blue gown and she looked perfectly pretty. Would any of you consider this gown for your Reception? 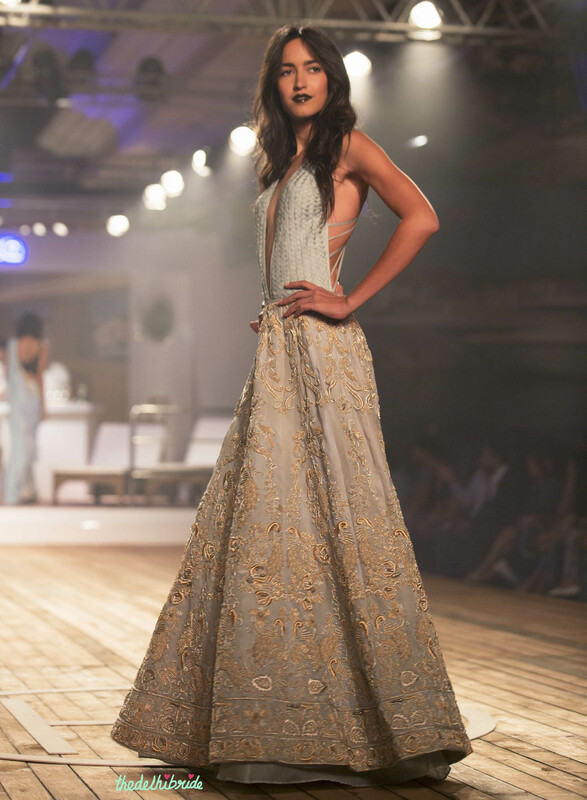 The second showstopper was Kriti Sanon, who put on an all new avtaar to channel a cool chic bride with tattoos and sneakers. I know sneakers with lehengas has been something a few brides have experimented with recently, but you know what? This is how it should really be done. Sure, wear sneakers, but pretty them up with matching embroidery. Spot on, Monisha. Spot. On. 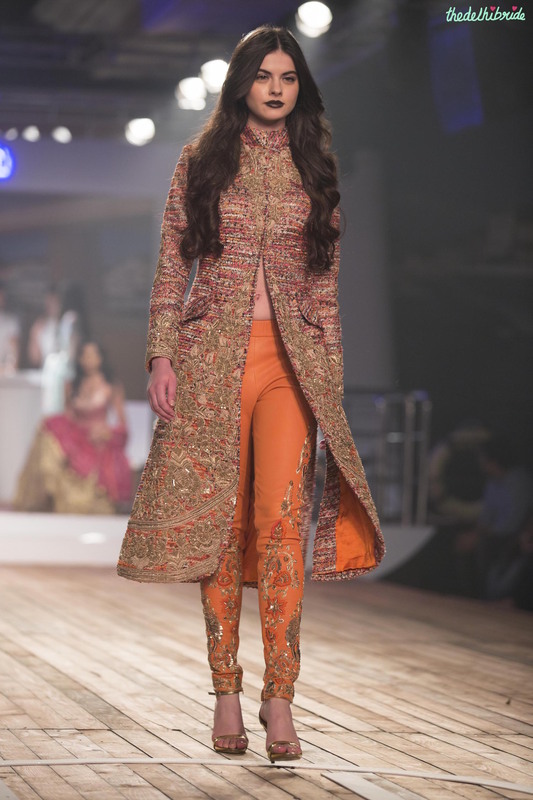 What do you think of Monisha Jaising’s show? And do you like the sneakers with lehengas idea? I felt equally un-inspired on day 3 of AICW.. I don’t follow all the fashion week shows, so I can’t comment on the overall lack of inspiration in the clothing line. I can say that I totally agree, the purple saree is to DIE for, I absolutely love the sheen and the simplicity of it. I need it. The rest of the collection is beautiful but I live a simple life and have no need for the heavy lahengas or suits. 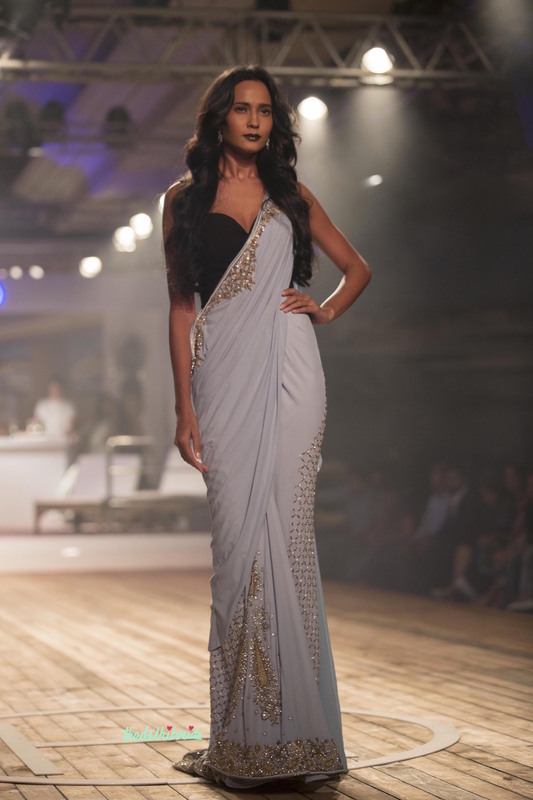 The purple sari is simple yet elegant in its own way. I would like to buy one. Is it possible to do an online purchase? I am interested in the wine pink saree. How to place an order? i like this wine purple saree. how to order it.can u please send me details.